Being a children’s specialist at Readings means constantly having one or more children’s or young adult novels on the go. We try to - and want to - read as much as we can but of course, like any reader, we have our preferences. There are authors who are already established as favourites, and those books we give priority to. Then there are books we feel we should read because the publisher has given it bells and whistles. So if an author isn’t already well-known and isn’t the lead title for the publisher that month, it’s much more challenging to get the book noticed and into the right hands. Hand-selling becomes really important and that’s what independent book shops like ours are celebrated for. This is just one of the reasons Readings established a children’s prize - this time we’re handselling en masse. What it has meant for the children’s specialists is that collectively we’ve now read eight books that we all consider to have made a great contribution to 2013’s Australian children’s books. We’ll continue to recommend them all and we’ll be looking out for new works from all the shortlisted authors. We loved the humour of Mark Pardoe’s Andy Flegg’s Survival Guide, like a younger version of a Nick Hornby book. Ruby Red Shoes Goes To Paris by Kate Knapp is a visual treat and we were so charmed by Ruby and her grandmother, Babushka Galina Galushka. The set-up of kung-fu fantasy adventure Jamie Reign by PJ Tierney had us all hooked and we admired Jamie’s character. Smooch and Rose by Samantha Wheeler has an empowering message for young children interested in conservation, presented in a really sweet story. The graphic novel Bloodhound Boys by Andrew Cranna works very well to draw readers into a story that cleverly blends humour and horror. Stay Well Soon by Penny Tangey is a skillful combination of tween voice, humour and pathos. And finally, The Girl Who Brought Mischief by Katrina Nannestad was loved too for its warmth, humour and classic feel. 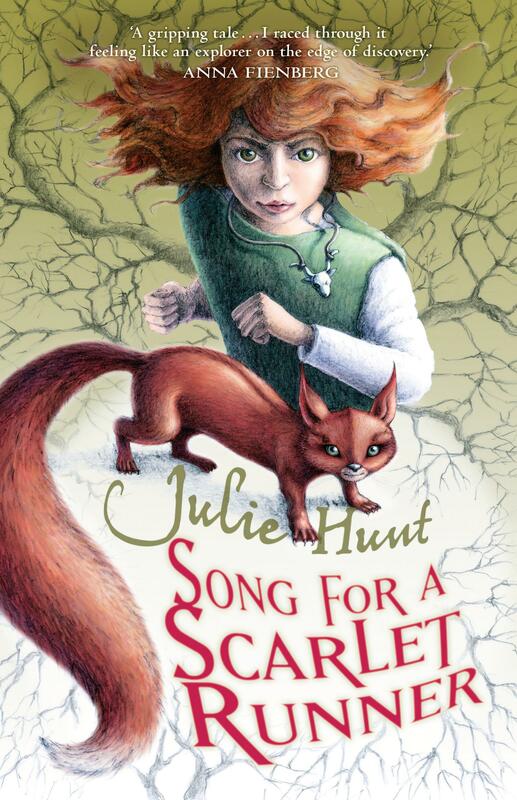 In the end it is Julie Hunt’s Song For A Scarlet Runner that has stolen the heart of every judge on the panel. We love its rich, credible world, from the bare rock shelter where the story begins, to the bustling night markets and treacherous marshes. In Peat, the main character, we see ambition, bravery and vulnerability – she is as strong and original as her story. Inventive and well-paced, the novel has a layered plot with much to give, but it also leaves plenty for the reader to think about. Every character is well-drawn and memorable: the good, the bad and the in-between, like Peat’s temperamental companion, the sleek, who comforts her one minute and bites her the next, or Marsh Auntie Eadie who can hear people’s thoughts. Even these minor characters could lead whole books of their own. This is a beautifully written story with wide appeal for readers aged from around 9 years up to young teens. I can’t wait to congratulate Tasmanian author Julie Hunt, with Sally and all the other judges - Holly Harper, Athina Clarke, Angela Crocombe and Alexa Dretzke - at our event in July. I hope many of you will be there too. This prize is about supporting new and emerging Australian authors but equally it’s about finding brilliant books for 5-12 year olds. So thank you to all our customers who have supported this prize so far, and especially to the young reviewers who wrote so persuasively for our blog. For the full shortlist and to read the thoughts of our young reviewers please visit our Readings Children’s Book Prize blog.